Denver Zoo is celebrating the birth of a critically endangered western lowland gorilla. The female baby, named Whimsie Adepa (ah-DEEP-ah), was born to mother Tinga (TIN-gah), and father Jim, just before midnight on February 25. 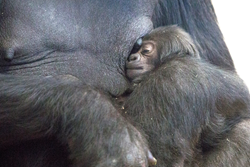 Whimsie Adepa, a female Western lowland gorilla baby born on February 25, sleeps on her mother's chest. This is Tinga’s first offspring, but zookeepers say she is quickly learning her new role as a mother. She is with Whimsie Adepa at all times, vocalizes to her and pats her back to soothe her. Denver Zoo is celebrating the birth of a critically endangered western lowland gorilla. The female baby, named Whimsie Adepa (ah-DEEP-ah), was born to mother Tinga (TIN-gah), and father, Jim, just before midnight on February 25. She is the first birth of her species at the Zoo in 11 years and the fifth ever in the Zoo’s history. The second part of her name, Adepa, translates to “good thing” in the Akan (AH-khan) language of Ghana. Guests can see her now at the Zoo’s Great Apes building. This is Tinga’s first offspring, but zookeepers say she is quickly learning her new role as a mother. She is with Whimsie Adepa at all times, vocalizes to her and pats her back to soothe her. Jim is now a second-time father, after his daughter, Jabali, was born in 2004. Zookeepers say he is noticeably protective and gentle. Tinga, herself, was the last birth of her species at Denver Zoo, in May 2005. She was born while her troop, from Los Angeles Zoo, stayed at Denver Zoo during the construction of their new habitat. She returned to Denver Zoo in November 2014. Jim was born at Los Angeles Zoo in August 1987 and came to Denver Zoo in April 2003. The two were paired under recommendation of the Association of Zoos and Aquariums (AZA) Species Survival Plan (SSP) which ensures healthy populations and genetic diversity among zoo animals. Fortunately, the couple has proven to be an excellent match. Western lowland gorillas live in the lowlands, swamps and forests of western central Africa. They can grow to four to five and a half feet tall. Adult males can weigh up to 500 pounds, while females are significantly smaller and can weigh up to 300 pounds. Their fur is predominantly black with a brownish tinge and a reddish-brown cap on top of the head. They are social animals and live in family groups, called troops, consisting of an adult silverback male, several adult females, and their offspring. Family groups may number from 2 up to 35 individuals but usually consist of five to 10 animals. The adult male and females usually stay together for life while the young leave when they reach maturity. Wild populations of the species are difficult to estimate due to the dense forests and constant movement of family groups, but there are believed to be only 112,000 western lowland gorillas and the number is declining. The International Union for Conservation of Nature (IUCN) classifies them as critically endangered. Their greatest threats come from habitat loss because of logging and agriculture, but recently, the hunting of primates, including gorillas, for the growing bush meat trade has further threatened their survival. About Denver Zoo: Denver Zoo brings education alive, providing a unique learning experience that sparks an interest in the natural world for visitors and program participants alike. Home to 4,000 animals representing more than 600 species, the Zoo is accredited by the Association of Zoos and Aquariums (AZA), which assures the highest standards of animal care.